Submitted by The Amethyst Dragon on 2018-03-29 14:08. The idea was brough up on the Vault Discord voice chat, so here's a caramel apple. 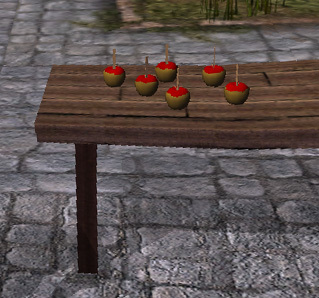 Edit: Added holdable caramel apple (torch model). TAD, I would have expected at least you to know not to post a "bare" hak. Please put it into an archive as browsers just open it as garbage when you click on it and people shouldn't have to right click and select download as. Fixed. Was in a hurry and both the hak and 7z were right next to each other. Also, added holdable version. Food items and placeables are fun but now as a holdable is even better!